Mini Jumbuk Nu-Wool wadding has been made in Australia for over 30 years and is a unique blend of 60% wool and 40% man-made fibre. Why is our Nu-Wool wadding so special and the best for quilt makers? Nu-Wool wadding is soft and thick with an even texture, making it a great pleasure to work with for both hand and machine quilting. Carefully prepared, Nu-Wool wadding is a unique blend of 60% wool and 40% polyester, specially treated with the Hi-Loft ® process. This very important bonding process increases loft and resilience, improves washability and reduces the possibility of any loose fibres protruding through the outer fabric. Why use Mini Jumbuck wool? Wool is a natural fibre. Ideal for hot and cold sleepers. We use an even filling that makes our product look tidy on your bed. Naturally anti-static and repels dust. Scouring - a process where the wool off the sheep's back is thoroughly washed in detergent to remove dirt and vegetable matter. Ultra-Fresh - provides lasting freshness and effective control against dust mites. Wash & Loft - a conditioning treatment to improve loft and cleaning. What is the Wash & Loft process and how does it make the wool washable? The term Wash & Loft incorporates several processes, both in the treatment of the wool and the way in which it is blended and carded. Mini Jumbuk's Wash & Loft wool incorporates MycraLoft technology, a conditioning process which enables the wool to be washed. The best way to explain how it does this is to understand the nature of wool fibres. Wool fibres are like individual human hairs. The shaft of each strand is covered with overlapping scales which can look into each other causing tangles (or in the case of wool, felting and shrinkage when it is washed). The MycraLoft treatment is like applying conditioner to your hair, making it smoother and less likely to tangle when you wash it. By smoothing the scales on their surface, the wool fibres can slide easily over each other and can be washed without felting and shrinkage. What is Ultra-Fresh and how does it work? Ultra-Fresh is an intensive anti-microbial and anti-bacterial treatment of the raw fibres that provides lasting resistance to the growth of mould, mildew and fungi. It is not removed by washing or dry cleaning. Many household allergies are caused by the common dust mite which breeds readily in untreated materials. Dust mites feed exclusively on discarded human skin cells, which need to be decomposing for the mites to consume them. Deterring the growth of mould and mildew prevents dust mites from being able to survive, breed and colonise your bedding. The Ultra-Fresh family of anti-microbials has 40 years of research and development behind it, and has been extensively tested and approved. It has been used world-wide with exemplary success, in products as varied as toothpaste, paint and clothing. Purchasing home-grown products rewards Australians, boosting our economy and benefitting the environment, keeping profits in Australia and minimising travel miles. Best of all, buying Australian Made maintains Australia’s prosperity and creates employment for our family and friends. 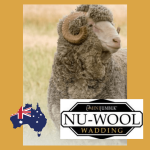 Nu-wool – proudly Australian made.